Notice the round flange "tabs" and the nut and bolt connectors; one oval and one round, they fit respectively on the third piece (not in photo). 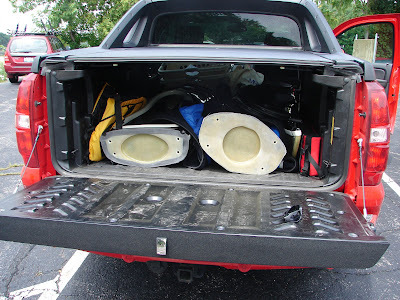 The 3-piecer fits neatly inside the stock plastic-covered 5 foot Chevy Avalanche truck bed. Unfortunately, the midgate--the panel between the cab and the rear seats, typical for an Av--has to be dropped down (eliminating the back seat for any rear passengers) because the length of each piece is over 5 feet. 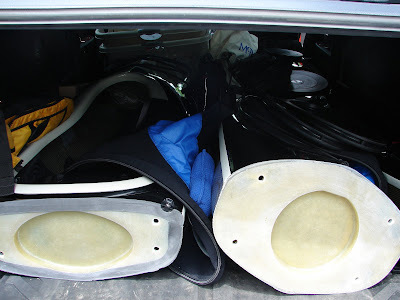 Note that no straps or racks are used to transport a sectional sea kayak in this fashion; saves tremendously on rack system (Thules and Yakimas are about $400 to get a system to haul a kayak). No need for Lasso locks or other anti-theft devices--would-be thieves do not know it's even in there. No rain in the hatches or cockpit, no lost hatch covers down the highway. Assembled, this boat is 17 feet one inch long. This photo only shows two pieces in the truck--the third, in sleeping bag carrying case--fits nicely on top. The best part about a three piece kayak inside the vehicle: not watching those fluttering, guitar-string tight straps on a long drive. "Is that getting loose? I think it's looser than it was 25 miles ago."